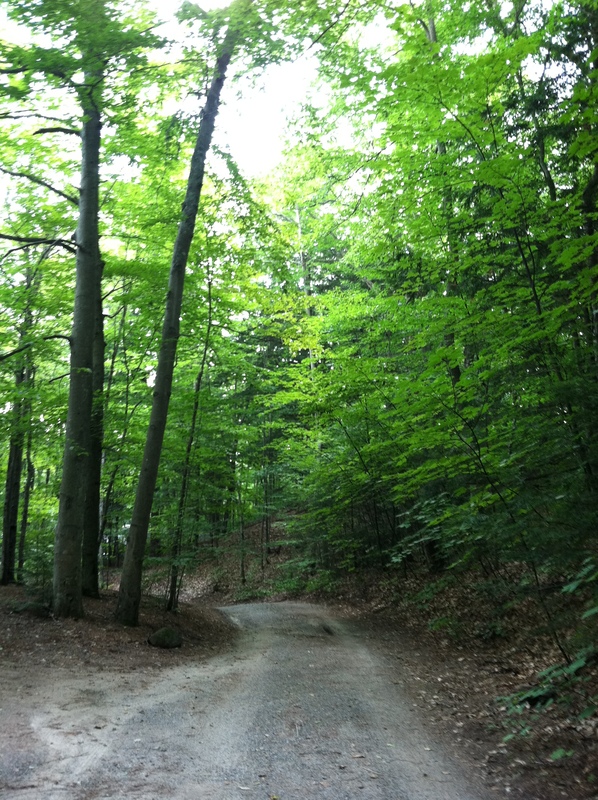 Here at Lake Todd in Newbury, New Hampshire, the house we rented is on a road unlike any other on which I have lived. Turn off highway 103 onto Alsubet Court, and you find yourself bumping down an unpaved dirt and gravel path hidden by tall trees. This single fact could be my greatest elation about the place we find ourselves living this week. 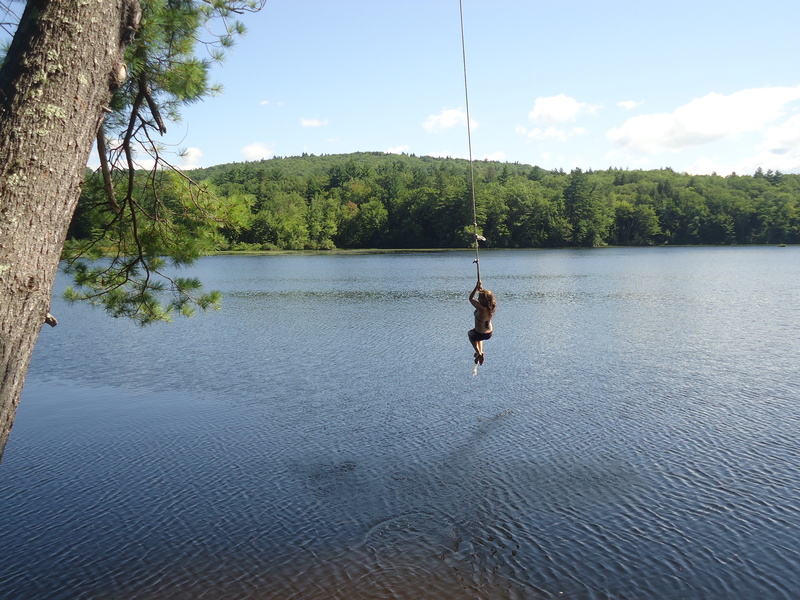 But that sentiment must go to the rope swing on one of the the three islands in the middle of the lake. After I worked up my courage to try it, Emmett proclaimed with joy, “Now our whole family loves it!” Eventually, that became true. This morning we floated on the lake (admittedly more my speed), paddling in circles, the sun impressing us by sending all clouds away. Sky and trees are everywhere. I look around and say, Yes, this is what I had hoped for. This is what I imagined. This is the life. Now, up on the porch, I hear the faint breezes more than I feel them. The trees are many, here, and they take the wind and sun before their full strength reach me. There are insects high in those trees whose sound is so tinny I thought it was an electrical surge the first time I heard it. City girl. 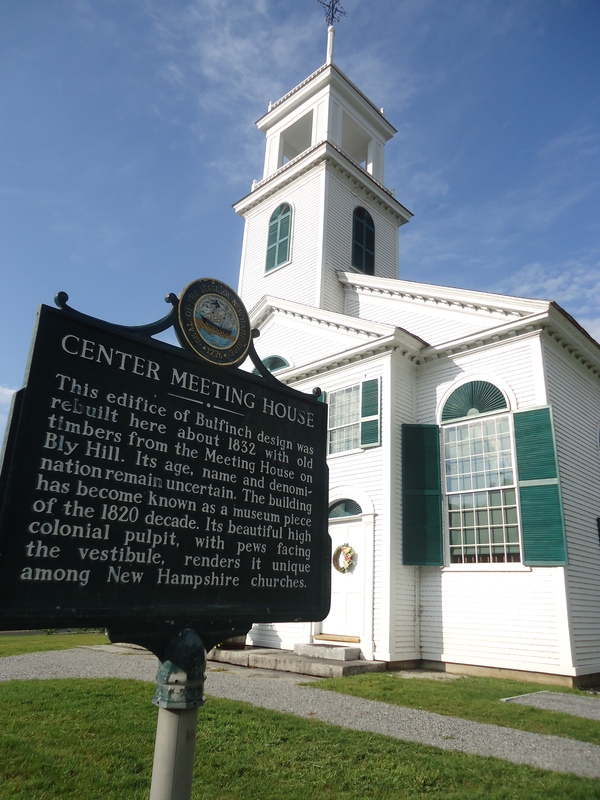 On one of our rainy days here, we got in the car with plans to head toward the Canterbury Shaker Village, not knowing exactly where or what it was. When we realized it would take us an hour in the car each way, and that the “prize” at the end was a history lesson that we would love but our kids would be in no mood for, we changed plans mid-drive. 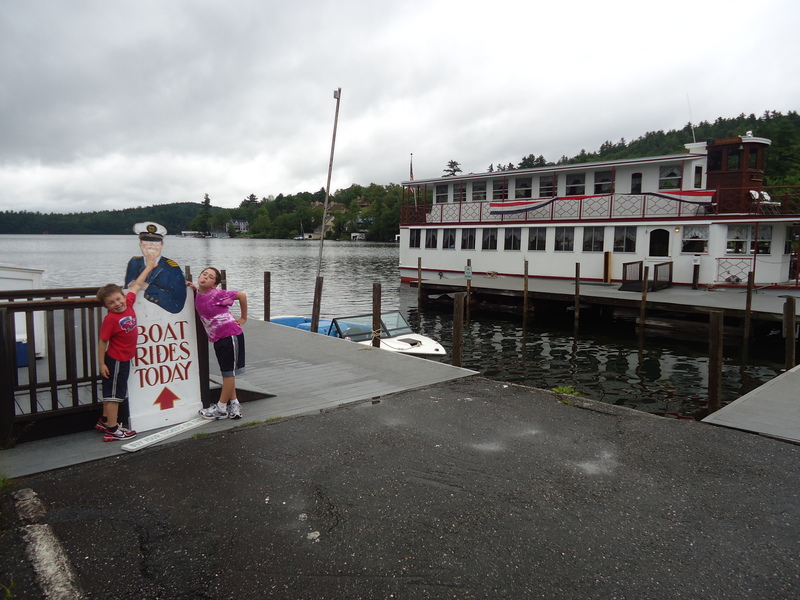 Instead, we circle back discover the town of Sunapee and its harbor and lake. 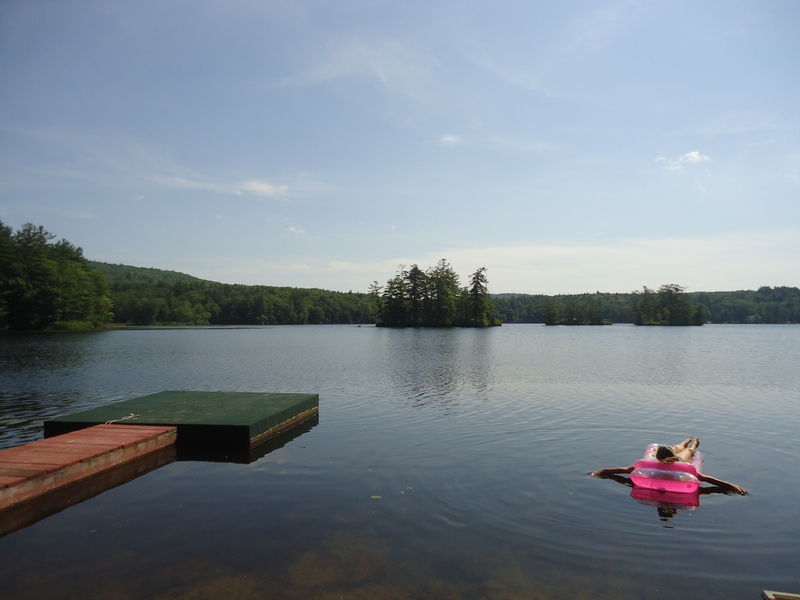 Sunapee welcomes tourists with small inns and house rentals, but it is far from the well-trod path around Lake Winnipesaukee, and in the winter Mt. Sunapee is a beautiful ski destination. We eat in a local café. 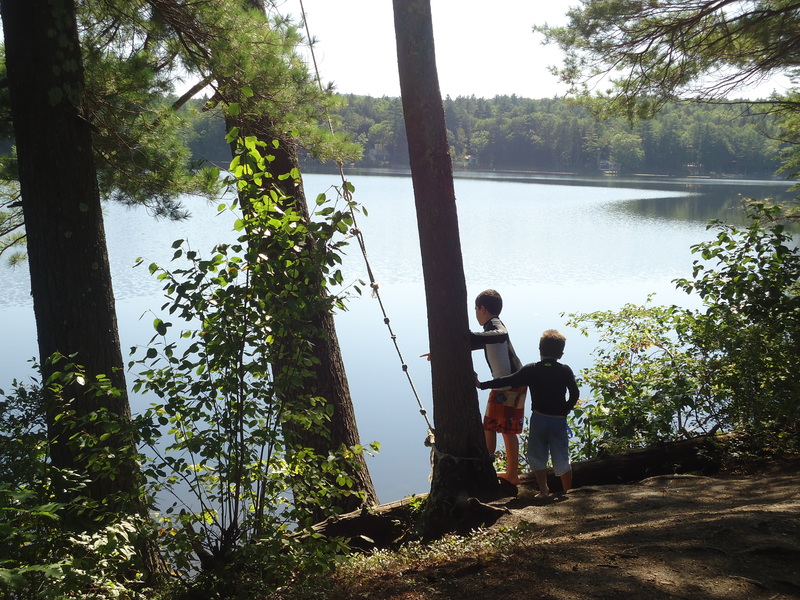 We play in a gazebo overlooking the lake and read about its history on signposts. We cruise around the west side of the lake back toward our home in Newbury. On our way, Christopher spots a park with a playground. It’s drizzling, and we are the second family there. Other tourists, I guess, from the New York license plate. We climb. We spin. 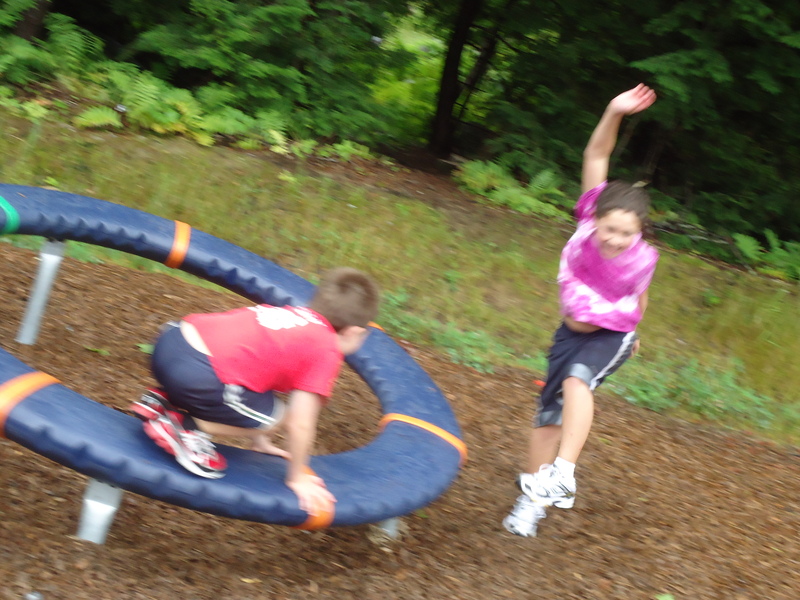 We play capture the flag on a huge hilly field, a natural one, with mountains and trees and boulders perfect for hiding a flag. We make a stop at the Newbury Library (“more community center than quiet place,” the librarian tells us), and while Christopher uses their WiFi for work calls, I eavesdrop on the local chatter — about the sports, the kids, who’s got talent, who’s got size. Not so different from home. On a shelf I see a book I own by an author I know and smile, a reminder of home. During our meandering travels, I sometimes find myself comparing each new town to my home, asking myself which place here is most like it, looking for the common ground. In the Sunapee area, New London (Est. 1779) wears that mantle, complete with abundant hair salons and upscale women’s clothing stores. It has a handful of restaurants, and for dinner we chose Peter Christian’s Tavern by its name, because to me it conjured up an old fashioned colonial place. Instead we got a bar food menu, from which my L.A. kid selected nachos – I mean, nachos in New Hampshire – what’s the point? We followed dinner with Annabelle’s ice cream, the name of which brought bright rosy color to Emmett’s face, conjuring up a friend from kindergarten who is awfully cute. Continuing along Main Street, we passed the town’s small liberal arts college located next to a large grassy field with a white wooden gazebo in its center. 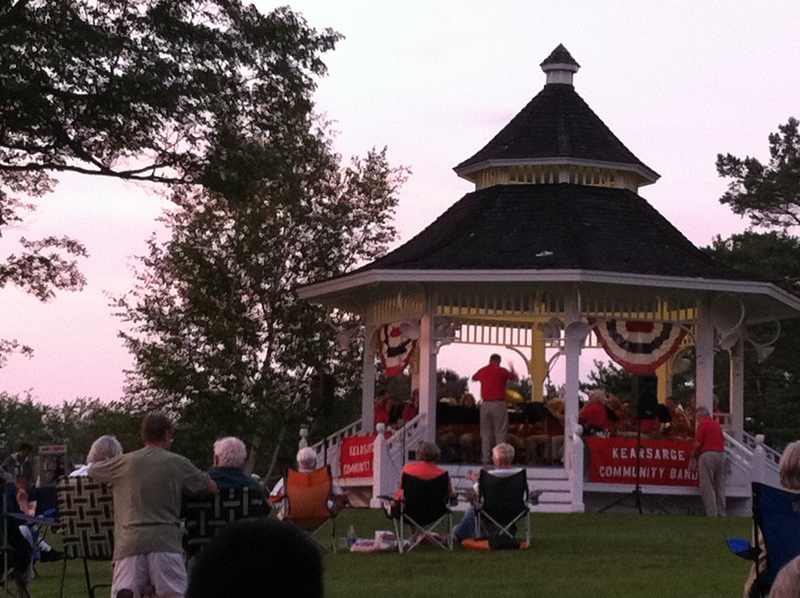 A sign announced that this was the Haddad Bandstand, site of Friday evening concerts in the summer. Our luck, we’d made it for the final concert. We alternated between playing Frisbee on the field and singing along to the Music Man, watching the sun set over Mount Sunapee in the distance. It reminded me of our town’s Saturday night movies in the park, with picnic-ing families, kids running around, and community spirit prevailing. Finally heading home after the concert, we passed the New London Barn Theatre, which was presenting the musical Chicago. Being a musical theatre geek, I lingered. But I wasn’t sure I wanted to hear a small town community theatre take on one of my favorite shows. As we started to leave, guided by the wisdom of getting some rest before another busy day of swimming and swinging, we could hear strains of the opening number coming from the windows. “Come on babe we’re gonna paint the town…” The sound stopped me. This was the real deal. Aaron was desperate to see it, and I was tempted, so we turned back and asked about tickets. The ticket lady looked at me and Christopher like we were idiots: “You know, this is a pretty adult show,” she cautioned. Yeah, we know: Adultery, murder, prison, slick criminal defense lawyers…We’re from L.A., ma’am. We can handle it. That was one voice in my head. The other voice, the one that prevailed said, Heck, at least for this week, we’re small-town folk. Time for some shut-eye. Next up…Stowe and Burlington, Vermont! Laura, I LOVE this. I felt it all like I was there, right down to the tinny insects and the sound of the breeze. Wow. What a wonderful, wonderful family adventure. My step-daughter is starting Connecticut College in New London in a few days. Was that the college you saw? Can’t wait to live more, vicariously, through you through New ENgland. Thank you Judy. So glad I can share it. 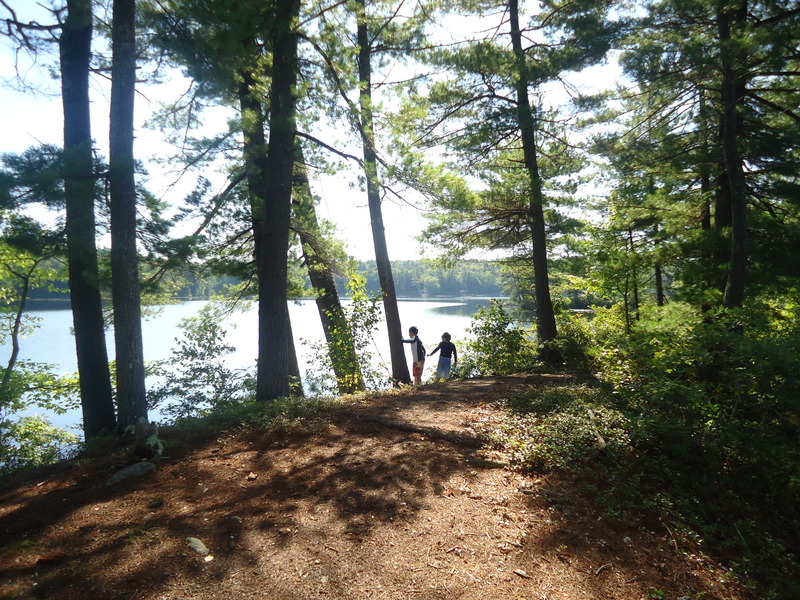 We loved New Hampshire, especially how far away from our usual environs we felt. Connecticut College must be in New London, Connecticut, while we were in New London, NH. Oh, those colonists — couldn’t they think of anything better than dear old London? We know another fabulous young woman starting Connecticut College, my brother-in-law Peter’s eldest niece, Julia (my niece-in-law?). And it is Peter’s alma mater, which he speaks of so fondly.